USA Gymnastics Trampoline & Tumbling will identify two gymnastics clubs in 2019 to participate in the program as Trampoline Development Centers (TDCs). Only member clubs of USA Gymnastics are eligible. Clubs may have an existing T&T program, but this is not a requirement. In 2019, USA Gymnastics Trampoline & Tumbling will identify one club for the Elite Trampoline Development Center (ETDC). Only member clubs of USA Gymnastics that currently have a competitive Trampoline Program with athletes competing Level 8 or above this season are eligible. Clubs may have been a previous TDC, but this is not a requirement. The Elite TDC consists of 2 three day visits, with one day designated to the free workshop. Classroom presentations include: training plan development, routine evolution, athlete leadership, coach leadership, and club administrative guidance for a healthy successful team, and skill/drill/sequence techniques. Hands on training will be included in each visit workshop. Trampoline is one of four events including in the gymnastics discipline of Trampoline & Tumbling, often referred to as T&T (the others are synchronized trampoline, double mini-trampoline, and power tumbling). Both girls and boys can participate in all four T&T events. In trampoline, you are sure to see numerous high-flying skills that include multiple flips and twists combined into one "routine". This is elite level trampoline at its finest but participation can also be thrilling and exciting while the skills are at a more basic or recreational level. Trampoline is an easy addition to an existing gymnastics program. Boys and girls of all ages love to jump around and tumble about – just look at the abundance of recreational trampolines and children's never ending motion. 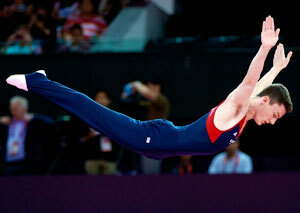 Plus, the sport of trampoline has become more widely known because of its status as an Olympic discipline. Using existing equipment in your gym, you can get a program started today! "We have found that trampoline provides a fun segue for gymnasts who are looking for a change and it keeps them involved in the gym," said Jacobson, whose goal is to expand the number of clubs that offer both gymnastics and trampoline. To learn more about Trampoline Programs, click here.